Mae's Food Blog: Bagels, Lox, Corned Beef, Challah, Rye Bread: What is Jewish food? Bagels, Lox, Corned Beef, Challah, Rye Bread: What is Jewish food? Schmaltzy in English today has become a synonym for corny, often applied to bad jokes. Excessively shmaltzy comedy routines and self-conscious, too ethnic, Jewish comedians aren't as popular as they used to be 50 or 60 years ago. 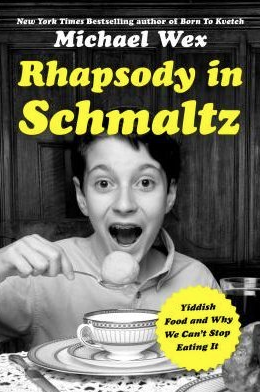 The word schmaltz makes me think of cheap jokes that bring up Jewish stereotypes -- old stereotypes that don't even particularly apply to the current generation. Michael Wex's book Rhapsody in Schmaltz is full of this unfortunate type of humor, often very out of date, so I don't know what younger readers would make of it. I find it hard to believe that the book was just published last year (2016)! Here's a sample corny sentence: "Goose fat is generally thought of as the tastier, more full-bodied schmaltz, the Jayne Mansfield of kosher cooking, as compared with the Audrey Hepburn that is chicken schmaltz." (p. 79). Wex also includes quite a few colorful Yiddish sayings that incorporate specific foods into insults, character judgements, or generic folk wisdom. For example, "to fall into a schmaltz mine" in Yiddish means either "to strike it rich" or or "to stumble into an unexpected stroke of good luck: 'I was looking for Archie comics at the swap meet and found a Gutenberg Bible for fifty cents— bin ikh arayngefaln in shmalts-gribl, I fell into the mother lode of chicken fat.' Ironically, someone who does so is often described as having treyfene mazl, unkosher luck, the Yiddish version of 'the luck of the Irish.'" (p. 87). Or this: "'kugel with lard'— kugl mit khazer-shmalts— is used in Yiddish to describe un-Jewish ideas that have been given a superficial coat of Jewishness. ... if Jewish liberals still spoke Yiddish, they’d be using it on Jewish Republicans who use their religious background to justify their social and political ideas." (p. 137). Rhapsody in Schmaltz also includes some reasonably decent historic discussions about Jewish food in Eastern Europe -- my reason for reading the book was that I expected some real history. Along with the schmaltzy jokes, the history is there; though the long digressions about the Biblical basis of some food customs are a bit tedious, as are explanations of the blessings that religious Jews said over various types of food, and how that affected their attitudes towards the food. Wex says that Sabbath foods are the mainstay of Jewish cuisine, so he spends a large amount of time describing them and how they came to be eaten on this weekly Jewish special day. My favorite element of the book is the way it explains how some seemingly Jewish foods of great historic longevity are of very recent adoption. Potatoes -- the food my father most remembered from his childhood in the shtetl -- came into Jewish life around 1800 or 1850 when they became staples in Eastern Europe. "Czar Nicholas I, more mindful of the potato’s superior yield and short growing season than of the recent disaster in Ireland, introduced its mass cultivation to his empire and transformed the East European diet." (p. 116). Other foods, like corned beef, unknown in Europe, were bound up with the history of delicatessens in American cities like New York and Montreal. Wex also covers foods that have been in Jewish life for centuries. For example, "Noodles— specifically egg noodles— are among the oldest Ashkenazi dishes and have occupied a prominent place in Ashkenazi cookery since at least the eleventh century, when they were mentioned under the name frimsls in the High Holiday prayer book of Simcha ben Shmuel of Vitry, who died in 1105." (p. 127). Bagels, lox, and cream cheese, now completely incorporated into American food ways, used to be a breakfast treat only for Jews and maybe other patrons of Jewish food establishments. Bagels originated in the Yiddish-speaking areas of Eastern Europe. Christian inhabitants of this area also baked and enjoyed bagels, but didn't come to America and start bakeries and delis. Cream cheese, on the other hand, is "a purely American product, invented in upstate New York in 1872." (p. 229). And lox is somewhere in between, having become associated with bagels late in its history and mainly in New York and other Jewish cities. Corned beef, pastrami, and rye bread, which also started as Jewish deli menu items, are now widely popular in the US. I was most interested to learn from Wex that pastrami and corned beef were strictly American developments in Jewish gastronomy, not at all from Yiddish cuisine. Rye bread in Eastern Europe, he explains, was far different from the product of American Jewish bakeries. "Delicatessen as we know it," he writes in his corny way, is "the food that kills those who love it best." And an "American variation on a few themes with roots in Europe." (p. 251). Chicken soup and gefilte fish became stereotyped Jewish foods in the US, though not without a reason. While chicken soup is cooked and enjoyed anywhere that there are chickens (which means everywhere), gefilte fish, Wex explained, was truly a Jewish invention for complicated reasons involving requirements and restrictions on foods eaten for the Sabbath. He also rants and rages because he hates gefilte fish from a jar, which is the only kind most ordinary Jews now less than 85 years old have ever really eaten. I think he missed some of the details of gefilte fish history, which I wrote about in a blog post some time ago here. Cholent and goose were also Sabbath and holiday foods in the shtetls and cities of Eastern Europe. Goose, obviously, was the bird Jews ate (and used as a source of schmaltz) before they switched to mainly chicken and sometimes turkey. Cholent, the slow-cooked Sabbath stew, is explained in great detail, for the benefit of his readers who may never have seen it. "Second only to matzoh in antiquity, cholent is the only other Jewish food that might have originated with the Jews themselves," writes Wex (p. 108). The discussion of cholent and its close relatives kugel, kishka, "the stuffed neck of poultry known as a heldzl," calf’s-foot jelly, and the fruit or vegetable stew known as tsimmes all, according to Wex, were close associates of cholent. Kugel is a noodle pudding or potato casserole with traditional ingredients. "Even non-Jews considered kugel the Jewish food par excellence," Wex writes. "In 1728, Jesuits in Vilna threatened to excommunicate Catholics who ate 'Jewish kugel and other Jewish dishes.'"(p. 132). Like cholent, kugel could also be slow-cooked to allow a hot meal to be served on fire-prohibited holidays and Sabbath. Unlike cholent, kugel has taken on a life of its own in modern America. In my opinion, Wex missed some details about kugel and its Americanization. I wrote about it a couple of years ago in this blog post. Challah is the Sabbath bread which seems to be a permanent forever fixture of Jewish Sabbath celebration. In fact, bread was part of the Sabbath ritual from early times, but the specific braided bread made with egg and oil came into Jewish life only around 500 years ago, "adapted from German breads baked for special occasions, especially Sundays." (p. 154). Matzohs and matzoh balls, says Wex, owe a lot to the American entrepreneurs who developed mass-market packaged versions of these and many other Passover foods. He writes of "the matzoh ball, which began as the food of dreams ... only to end in the depressing ubiquity that has made it the main ingredient of too many lousy jokes." (p. 97). Carrots -- "Whether anchoring a tsimmes, floating in chicken soup, or crowning a piece of gefilte fish, the carrot is among the preeminent Yiddish vegetables, in part because its Yiddish plural form, mern, is identical to the Yiddish verb that means 'to increase.' Along with apples and honey and various other foods, it is eaten on the night of Rosh Hashana as part of a tasting ritual that presents our hopes for the new year in edible forms. ... Carrots are eaten to go along with a supplication that our merits might increase." (pp. 143-144). He mentioned chopped liver but it didn't feature as much as the other foods. It wasn't a big deal like the Sabbath foods. Oy! Do I really need to read this book after that lukewarm review? Maybe, if through some sort osmosis my dearly deceased father would care for it. Well, Chuck, I'm not sure your father would have been as negative as I was. It's definitely a very exaggerated style, though, and the author really hates bottled gefilte fish. "Dinner With Darwin: Food, Drink, and Evolution"
Wordless Wednesday: Topped with Cheese!